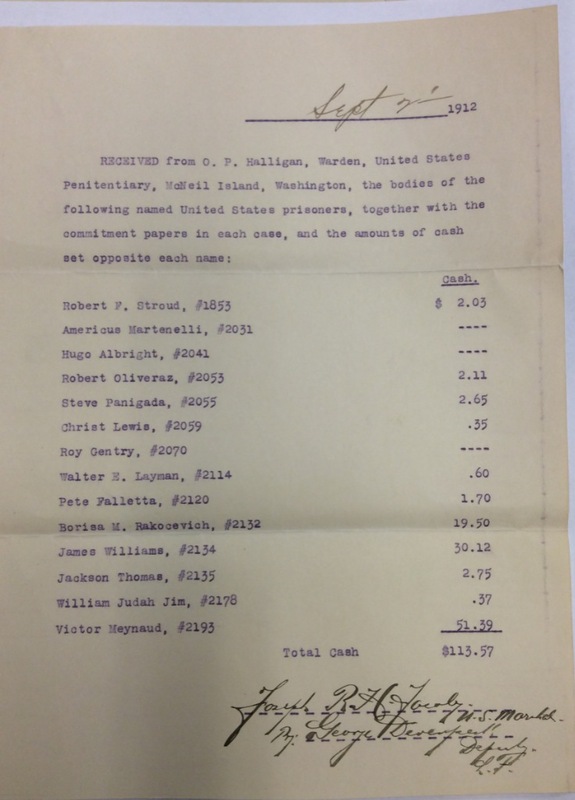 I'm looking for federal records pertaining to the payment of (documentation of) transportation for Federal prisoners (@ 1912) over the railroad: McNeil Island Penitentiary to Leavenworth Penitentiary. I'm looking for federal records pertaining to the payment of (documentation of) transportation for Federal prisoners (@ 1912) over the railroad: McNeil Island Penitentiary to Leavenworth Penitentiary. Specifically, I'm looking for the paper trail of a transfer of prisoners from McNeil Island to Leavenworth Penitentiary. This took place during the first two weeks of September, 1912. Any suggestions / leads would be appreciated. Re: I'm looking for federal records pertaining to the payment of (documentation of) transportation for Federal prisoners (@ 1912) over the railroad: McNeil Island Penitentiary to Leavenworth Penitentiary. The McNeil Island Penitentiary records are in the custody of the National Archives at Seattle. The email address is seattle.archives@nara.gov. The U.S. Penitentiary Leavenworth records are in the custody of the National Archives at Kansas City. The email address is kansascity.archives@nara.gov. Please contact them directly for access to these records and to search for the documents you seek. Thanks Rebecca. (I am actually 15-year volunteer at the National Archives at Seattle.) I've scoured the records at both of these archives. And have not found anything related to 'payment for services rendered' for this train trip. I've located the document where the U.S. Marshall accepted the prisoners from the Warden at McNeil (see attached). In addition I have a letter from the Warden of McNeil Island to the Attorney General, Washington DC (dated August 13, 1912) where he recommends the transfer of prisoners, based on a discussion with Mr. R. V. LaDow, Superintendent of Prisons and Prisoners. And the response letter from the Attorney General to the Warden (dated August 22, 1912). And another letter from the US Marshal (Western District), Joseph R. H. Jacoby, to the Warden (dated August 29, 1919) concerning the logistics of the transfer. I'm thinking that these type of records would be elsewhere within the Department of Justice that oversees these individual institutions. I just can't seem to pin down where, within NARA, these records exist. Wow the birdman himself robert stroud - neat!